People recovering from a substance use disorder are faced with a challenging journey. Once the first (and often hardest) step of asking for help is out of the way, your loved one will now need to face the day-to-day highs and lows along his or her road to recovery. As a friend or family member of someone in recovery, being supportive and wanting to help is essential to helping your loved one stay clean and sober. In celebration of Recovery Month, today’s we are sharing eight ways you can help your loved one. Focus on the treatment plan. Once a plan is in place with the help of a substance use disorder counselor, help your loved one stay on track and stick to the plan. The plan may include individual, group, or family therapy, medication, and other types of rehabilitation. You can help by driving your loved one to meetings, having coffee and talking afterward, or helping them stay organized and motivated. Encourage sobriety from all substances. While on the road to recovery, it’s important to stay away from all substances. While a loved one may be in recovery for opioid abuse, he or she may feel like they can still have a few alcoholic drinks once in a while. However, it’s counterproductive to trade one substance for another. Instead, help to limit exposure to events and people that may not be the best influences. Be available. Let your loved one know that you want to help and be supportive. Then make sure you are able to talk and offer support when needed. This can include both phone calls, encouraging text message, and in-person visits to help your loved one know they are not alone and they have you to lean on when times get tough. Create a safe and healthy environment. During recovery, it’s especially important to help your loved one feel content at home. Help create a home environment that is free of alcohol and drugs. Additionally, work to make the space calming and peaceful. Surround yourselves with healthy activities and healthy people. Promote healthy choices. In addition to a calming home environment, help your loved one make healthy choices. Focus on a balanced diet, a good night’s sleep, and adequate exercise. Staying healthy and active will help promote a healthier lifestyle free from substances. With an abundance of guided meditation and yoga videos available online and on phone apps, there’s always a way for your loved one to take a time out to focus on inner peace. Help your loved one find a network of peers. When in recovery, oftentimes your loved one will have to distance him or herself from the people they were using with. Each person is different and not everyone will recognize they need a social network, but finding relatable peers is a key aspect of recovery. 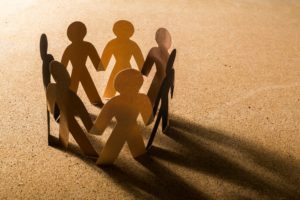 While treatment plans often include group therapies, other avenues for helping your loved one may include encouraging participation in community meetings or other social events. Encourage self-care for your loved one. You can’t always be there, so encouraging and praising your loved one to take personal responsibility represents another important aspect of recovery. Encourage your loved one to define and work on their goals. Ask them to start with small attainable daily goals, working toward larger life changes. Recognize set backs and seek help when needed. Not every person is the same and not every treatment plan will go off flawlessly, so look to spot issues before they arise. If you begin to feel overwhelmed, it’s likely time to call your loved one’s doctor or counselor for support reinforcements. Bonus Tip: Remember to take care of YOU! You know when you’re in an airplane and they tell you that in case of a drop in cabin pressure to secure your oxygen mask before assisting others? You can’t help anyone if you aren’t ok yourself. So make sure you take time for yourself, seek counseling or support from friends, and take time to decompress! Ask for help. You don’t have to go it alone. We’d love to hear them! Please comment below or private message our Facebook page.